Powerful, Consistent Cooling Airflow Regardless of Engine RPM! 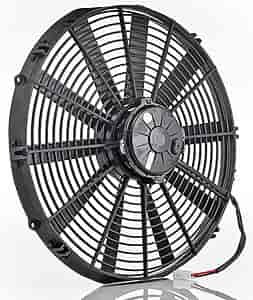 Qualifier Series Fans are Be Cool's most popular and diverse line of electric fans. They are available in a wide variety of CFM (cubic feet per minute) ratings and applications with distinct fan blade shapes. Made in both puller and pusher models with everything from a single 7-inch fan to a dual shrouded 13-inch fan set, all Be Cool electric fans feature sealed a motor with a lifetime guarantee. Be Cool's high-torque electric fans offer a powerful, consistent cooling airflow regardless of engine RPM. This compares very favorably to an engine-driven fan's output, which is limited by engine RPM. At slow driving speeds, such as during a cruise or a parade, an engine-driven fan is producing the least airflow when your engine actually needs more cooling air. Be Cool fans not only provide the airflow needed by your cooling system at low speeds but, in most cases, they also allow for the removal of a vehicle's engine-driven fan which can result in a significant horsepower gain as well as fuel savings. Be cool offers a couple motor choices: Super Duty, Hi-Torque, Medium Performance, and Thin Line. The Qualifier Series also offers the widest range of vehicle applications: daily driving; Road Course, Off-Road, Drag, or Circle Track racing; towing; drifting; and extended idling, such as parade vehicles. All Qualifier models have a high-tech Euro-Black finish.